The subject of this issue of Entrentre is a drawing by architect Charlotte Erckrath. The drawing was first developed for an exhibition at Modtar Projects in Copenhagen, 2012. It was installed next to the entry of the main exhibition space at the top of a small wooden stairway. The drawing depicts this entryway and a mechanical device Erckrath developed for the site. 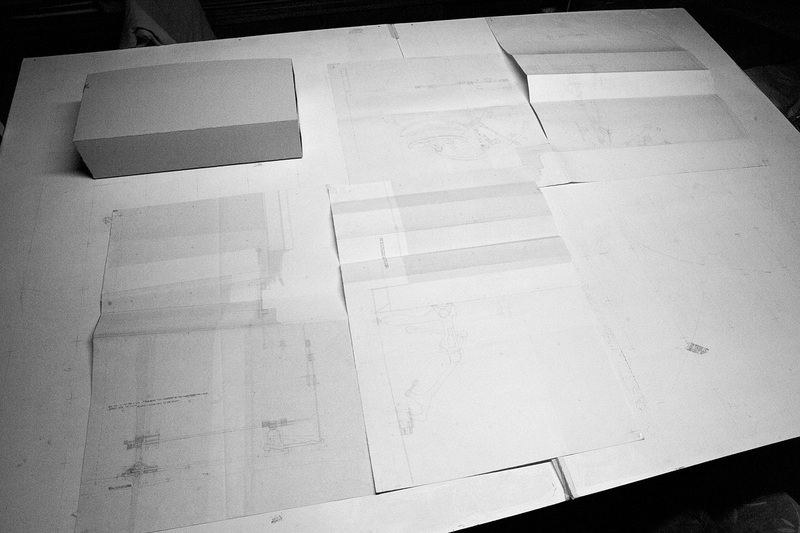 Charlotte Erckrath works with drawings, texts and the making of spatial devices. In her work architecture is discussed as an open territory. Her interests range from visual and measuring devices to descriptive geometry, pictorial exploration and theories of architectural drawing. Erckrath currently holds a position of an assistant professor at the Bergen Architecture School in the field of DAV (‘Den andre verden’ /The Other View). Interview by Anne Friis, March 2019. AF: Which role do the folds play in the drawing? CE: They are a consequence of hinging the sheets of paper that contain the individual sites into one continuous spatial narrative. This map-like construction aims at relating the places through the rules of orthogonal projection and folds the three-dimensional space into the drawing plane. The folds follow the logic of a hinge between two projections. I am interested in this idea of the hinge as they are opening a realm for imagination. Reading plan and elevation together encourages constructing an understanding of the object in the mind. The hinge in that way is an agent to construct space. There are some additional folds that add a sense of spatiality to the drawing. They start to operate together with the text, more like the folding of a page of a book, which is about revealing the space or the narrative over time. The drawing does not present itself fully at a single moment, instead there are different ways to come across it. By drawing only what matters about the space of the doorframe, the folded map allows to bring the threshold of the doorframe into a new relationship. Gaps are appearing and the map is not fully consistent to the actual site. My map transforms the site and constructs a new idea of the entryway and how you encounter it. AF: To accompany the interview you have prepared a series of photos of the drawing. Representing a delicate pencil drawing digitally is never easy, and in case of this project it is further complicated by the drawing's spatiality. How have you been working with the drawing for this online presentation? CE: I always saw the drawing as an artefact, as something to be grasped as a whole before entering into the detail. This quality is difficult to represent on a screen, but working with the content eventually led to constructing a photographic journey through the drawing. The first attempt used a parallel view to the drawing, which reveals more of the contradictions of the folded map and suggests many possibilities within it by the folds and gaps that operate within a space of multiple dimensions. For this webpage, finally an oblique view was chosen to emphasize not only the subjective view of the reader but also the drawing as artefact. The surface of the paper has its own presence, when looked upon in an oblique way. In contrary the parallel view seems to confuse the drawing plane with the plane of the screen and the drawing loses its material reality or even spatiality. In this case the paper actually adds a disturbing layer, because it rarely reproduces evenly. The linear journey became a tool to consider the reader in the drawing. At the same time it transforms the space in the map when passing the folds and the hinged drawing planes, while the shifting from horizontal to vertical to cross-section undermines the coherence to a spatial linearity. As the journey revisits a place in the map additional parts of the drawing appear, which have been initially hidden in the folds. Other areas become at times continuous or discontinuous. Since we share work mainly via screens, these issues become very relevant. Compared to the digital drawing the hand drawing certainly has disadvantages when it comes to being represented in this media. It is much less capable to adjust to the scale of the screen.